Jon Kent and Ian Wayne are opposites in every way except one--they are the sons of the World's Greatest Heroes, Superman and Batman! To uncover a global conspiracy, this unlikely duo will need to learn to trust each other and work together to save the Earth. But who is the mysterious Candace, and what secrets does she hold that could be the key to everything? 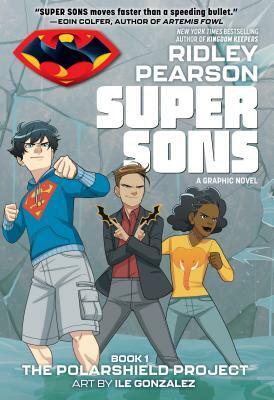 From New York Times bestselling author Ridley Pearson (Kingdom Keepers) and artist Ile Gonzalez comes the first book in an epic new series that follows the Super Sons of Superman and Batman as they struggle to find their place in a rapidly changing world! Ridley Pearson is the best-selling coauthor (with Dave Barry) of Peter and the Starcatchers, Peter and the Shadow Thieves, Peter and the Secret of Rundoon, Escape from Carnivale, Cave of the Dark Wind, Blood Tide, and Science Fair. He is also the author of eighteen novels, including internationally best-selling series Kingdom Keepers, Cut and Run, and The Middle of Nowhere. The stage adaptation of Peter and the Starcatchers earned the most Tony nominations (9) of any play in history. Ile Gonzalez illustrated her first comic strip while in kindergarten, and grew up to study fashion design in college. Deciding that graphic storytelling was her first true love, she refocused her creative effort and landed her first paid work at the digital storytelling company Madefire, working exclusively for them to co-create their popular middle-grade series The Heroes Club. Super Sons is her first graphic novel, and her first project for DC.